I've been so loving my Lilly ‘designer' dress that at last I found the time to make another, and add on a few variations. With this simply shift dress pattern, it's all about the fabric and the embellishments, and you can use this versatile pattern to create any number of different looks. Here is the original Lilly Shift Dress in a floral print and with a bright blue floral trim. 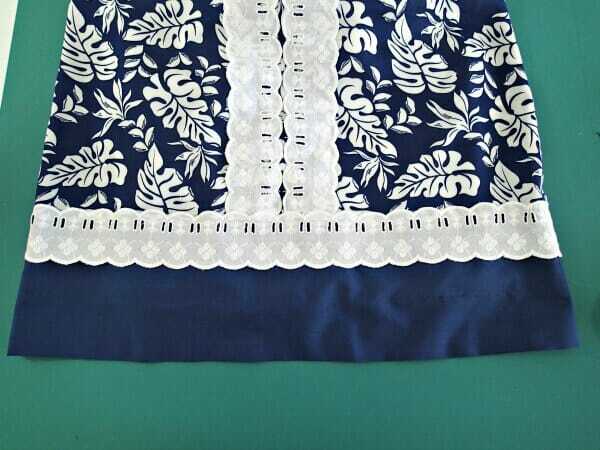 I still wanted a tropical look, but something a little more formal, a little understated and so I found this great blue and white print at my local store and matched it with a plain navy contrast strip at the bottom of the skirt, and some wide lace. Check on the length of your finished dress, and then decide on how wide you want your contrast band to be. Remember to include how much you will turn up for the hemline, and a 1/2 inch for the new seam you will create by joining the contrast band to the main part of the dress. Fold up the bottom of your pattern accordingly and cut your pieces. Your lining piece will not need a band and still uses the full pattern piece. Prepare all of your pieces with the darts as per the usual sewing instructions. 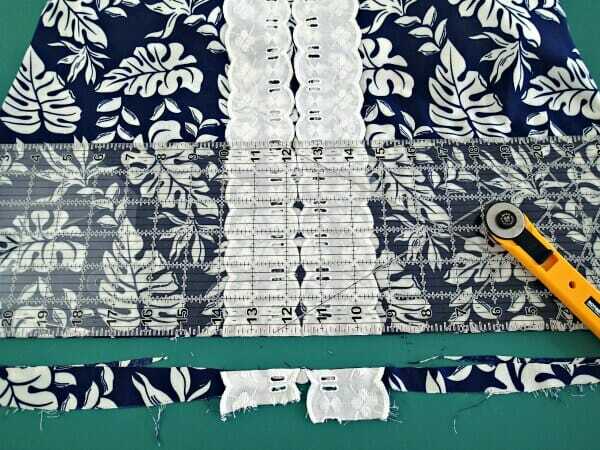 Mark or press a line down the center front to use as a guide when sewing on your trim or lace. Allow your lace trim to overhang a little top and bottom. I added two rows, making sure the scallops were even with each other. Proceed then as per the regular sewing instructions. Once the dress is assembled, the zipper is in, the lining completed and the sides sewn, then trim and square up the bottom bottom edge of the dress if necessary. Try on and check the length, and use the bottom part of the pattern (that you folded up earlier) to cut your contrast band. Sew the sides of the contrast panel to form a big loop and check it carefully that the side seams on the panel match to the side seams on the dress. Adjust if needed. 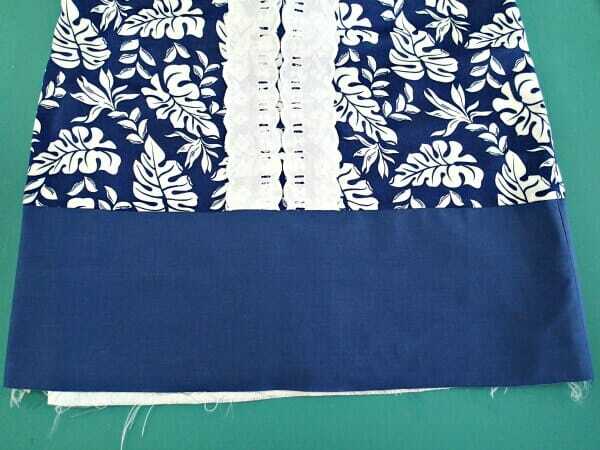 Match up the side seams and sew on the contrast panel. Give it a press and then try on and check the length again. Hem the dress using a method of your choice. 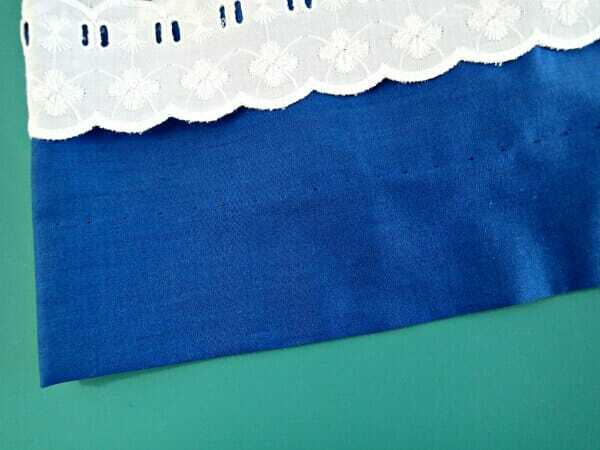 I used a wide flexi-lace hem facing and then a hand catch-stitch. I don't hand sew much, so this was actually quite enjoyable. 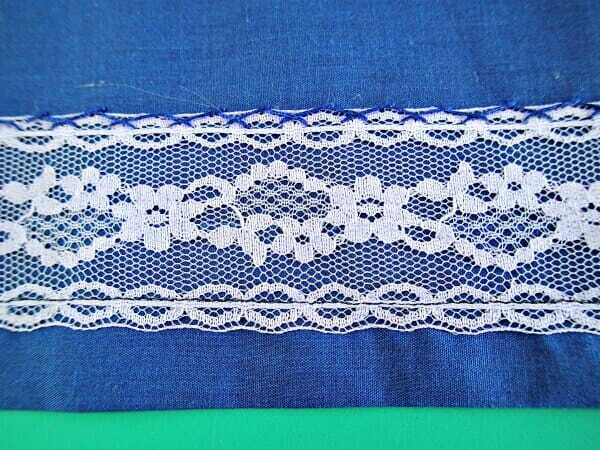 The design in the hemming lace helped me to keep my stitches nice and even. 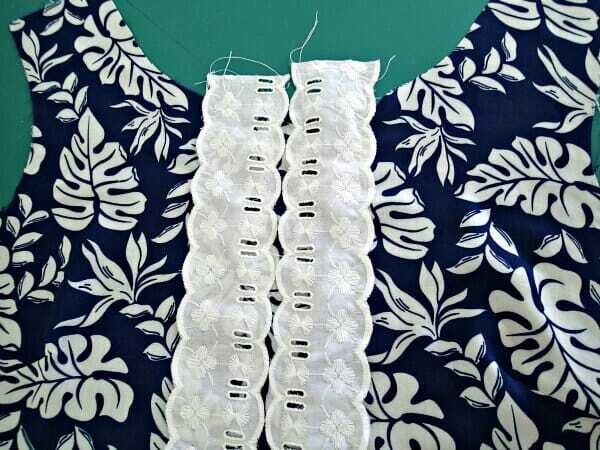 Add the lace, trim or embellishment of your choice around the top (or the bottom) of the contrast panel, and your Lilly Dress is completed. 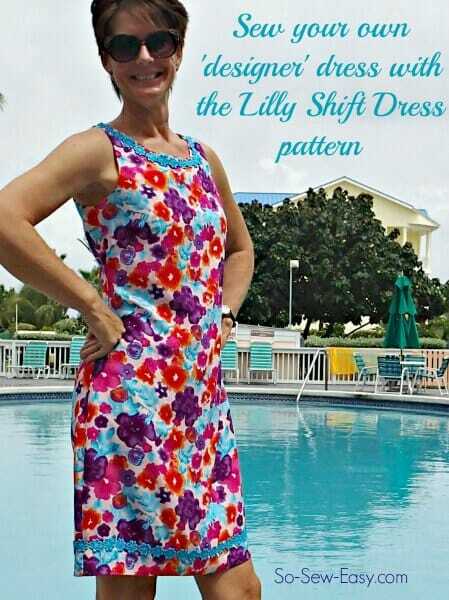 Has this given you some ideas of how versatile the Lilly Shift Dress pattern can be? You can create a whole wardrobe of designer-look dresses with this simple pattern, by varying your fabric, print and trims or by adding a simple contrast panel. Now after all that sewing and modeling, I deserve a quick dip in the pool. What variations do you have in mind to create your own ‘designer' Lilly dress? I love it! The style and trim idea is almost identical to my favorite shift I made in the late 1960’s. Time to do it again. Oh I so wish this pattern came in my size. 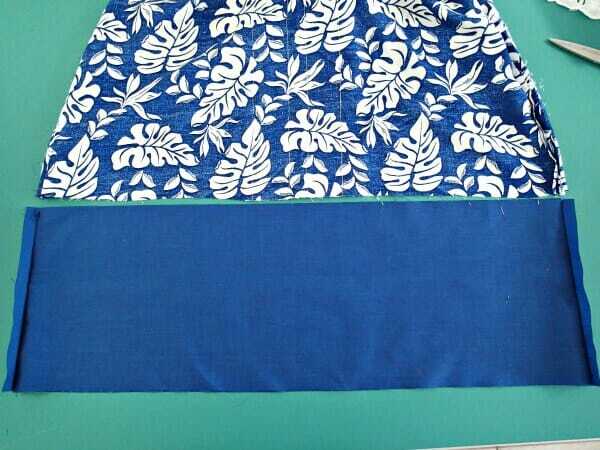 How would it work to do the navy bottom contrast doubled – ie have the raw edges together and sew to bottom of the dress. You would have your length correct except for the width of the band plus seam allowances. Then no hem and it would not be too heavy. I’m going to try that on my summer dress. What a great look. Yes that would work OK too. I was just worried in the heat, it would lose its bottom crease and end up looking a bit baggy if I did it that way. Fabrics can behave a bit odd here in the heat and humidity! Lovely new take on your shift dress, Deby. Really lovely. Hi love the Lily dress and love what can be done with it. I used to make similar ‘sack’ dresses as they were then called and sometimes put a small gathered frill of the fabric around the neck or the hem edge. So much can be done with them they are a great part of a wardrobe. They would look lovely with you little shrug top as well. Like all of Deby’s pattern very usable and easy to wear. Plan to make a few for wearing when it gets warmer. Deby, the new dress is delightful on you and looks so different from the first one, both are lovely. Thanks very much Sheila. I love this pattern, its so simple which means its so easy to change it up and create something different from the same original pattern. I love the dress. The lace makes the dress pop. Super cute in your latest version. LOVE em both Deby!! Especially the second one! I have some great ideas for this pattern!! Hi, I love your designs, and I would love to get the patterns. However, I am never able to get any of them downloaded from Craftsy. I’ve tried so many times I’m just sick of trying. I used Windows 8, Google Chrome, and I have a PDF program to use, but nothing seems to work. I just wish it was much simpler. Why do you have to sell your things on another website? Why can’t a person just download your products on your own website. I am so disappointed that I can’t make things work, because I love so many of your things. I like your style in clothing, and it’s very much like my style style in clothing. If you can offer me any solution to my problem, I’d sure appreciate your sharing it with me. The reason I do it this way is three-fold. Craftsy is a big company with huge resources so their site is always up and running. It means that people can buy or access the patterns anywhere in the world at any time, safely and securely. Craftsy also take care of password security, collecting the payment and delivering the pattern to you. They also store those patterns in each persons individual pattern library so if at any time in the future, you get a computer crash, lose your computer or just switch to a new one, you can login to Craftsy and all of your patterns are saved there safely and you can download them again at any time with a single click instead of sending me an email and waiting for me to do it. Craftsy is also very easy to use – or at least most people find it easy to use. And lastly, its down to resources again. I get almost 70,000 pattern downloads every month. Obviously almost all of those are the free ones, but the files are large. If I had to upgrade my website server to allow for that amount of data to be downloaded from the site every month, it would cost me so much money that I wouldn’t be able to afford to run the site at all. Craftsy do it for me for free. All that being said, it really shouldn’t be difficult and if you write to me when you have an issue I can usually sort it out in a couple of emails. I can even do you a video to show you the steps to take. So drop me a line and tell me what you do and what goes wrong, or at what point in the steps it goes wrong, what error message etc you get and I’ll be happy to help out.